Suitable for use gel, acrylic or fiberglass for application. 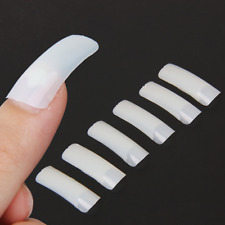 Gently suitable for acrylic nails extension / UV gel nail extension. QTY：100pcs. There are length and numbers marked on each nail form which can provide an accurate guide for making your pretty nails. Total: 500pcs. Easy to apply and hold with nail glue. Grab The Deal ! Colour : Natural. Within UK ~~~. 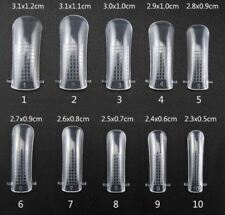 10 different nail sizes for you to choose from. 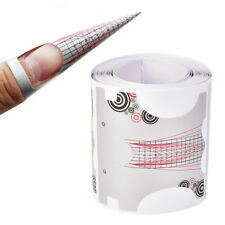 Perfect for painting & applying nail art decorations. Suitable for use with poly gel, acrylic applications. Material: Plastic. Color: transparent（as picture shown）. If you are not satisfied with the item, you can. as we would love the opportunity to make things right. Suitable for use with poly gel, acrylic applications. Material: Plastic. Color: transparent（as picture shown）. as we would love the opportunity to make things right. If you are not satisfied with the item, you can.